The tropical monsoon climate experiences abundant rainfall like that of the tropical rain forest climate, but it is concentrated in the high-sun season. Being located near the equator, the tropical monsoon climate experiences warm temperatures throughout the year. 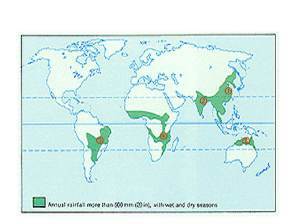 The monsoon climate beyond the equatorial region between 10◦ and 25 ◦ and North and South of the equator. The countries are along the coastal regions of southwest India, Sri Lanka, Bangladesh, Myanmar, South western Africa, French Guiana, and northeast and southeastern Brazil. The major controlling factor over the monsoon climate is its relationship to the monsoon circulation.The Monsoon is a seasonal change in wind direction.